Colon Hydrotherapy, also known as Colonic Irrigation, was first recorded 1500 B.C., in an ancient Egyptian document. Since then however, the knowledge and technology has advanced considerably, allowing it to be practiced in a safe and professional manner. It has been said that the United Kingdom is one of the most constipated nations in the world, where one in three people consulting their GP's have a bowel problem. The colon has been referred to as the sewer system of the body. It is the place where we store the waste material that most of us would rather not think about and most of us don’t, until our health becomes poor or we experience persistent constipation or diarrhoea. Furthermore, Colon cancer is believed to be the second leading cause of fatal cancer in the United Kingdom. Colonic hydrotherapy is a safe, effective method of detoxifying your body by removing waste from the large intestine, without the use of drugs. By introducing filtered and temperature-regulated water into the colon, the waste is softened and loosened; resulting in evacuation through natural peristalsis (wavelike movement). The Colonic lasts approximately 35 - 45 minutes and is best used in combination with good nutrients and fluid intake as well as exercise. Using state of the art equipment, we provide a high quality service, which will speak for itself. For more information please refer to the FAQs. 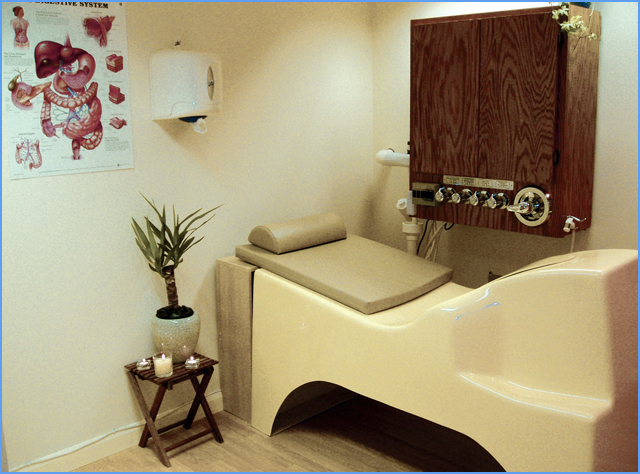 Modern FDA Colon Hydrotherapy equipment is used during your Colonic. Registered FDA equipment features temperature and pressure controlled water, a built-in chemical sanitising unit and a water purification unit. The unit is cleaned and sterilised after each treatment and each client has his or her own disposable rectal tube, which is only used once to prevent contamination. You will be shown how to gently and easily insert the rectal tube yourself and then be left in privacy to do so, the sterile tube comes individually packed for single use. The equipment that we use, allows you to be left in privacy if wanted while regulated by the therapist. Alternatively, the therapist can stay with you throughout the session, which ever you feel most comfortable with. We have both gravity fed or pressure controlled options. The equipment that we use, allows you to be left in privacy if wanted while regulated by the therapist or the therapist can stay with you throught out the session which ever you feel most comfortable with. We have both Gravity Fed or Pressure Controlled. The Colon, also referred to as the large intestine or bowel is the last 1.5 meters of the digestive tract. An extremely important organ made up of muscle structure that moves digested food along by a natural peristalsis (wavelike movement), and completes the digestive process. Other vital functions of the colon include the absorption of water and nutrients as well as synthesising certain B-complex vitamins and vitamin K.
How Will Colon Hydrotherapy Help Me? The gentle infusion of filtered, temperature controlled water helps detoxify the body by flushing out old impacted faecal matter, dead cellular tissue, mucous, parasites etc., that could have potentially remained in the colon for sometime causing a toxic build-up making you feel ill, exhausted or weak. Feeling irritable, grumpy, exhausted, sensitive, sluggish, stressed, comfort eating or having problems sleeping? These signs and many more may mean that your body is in need of a detox. Due to modern lifestyles we are exposed to stress, processed/refined foods, partying and other factors that build up toxins in our bodies. These make us unhealthy and cause health problems. Regular detoxifying helps prevent these problems. Colon Hydrotherapy can play a vital role in doing this. Your dignity will be maintained throughout your session and you'll be completely covered during the procedure. The therapist will set up the unit and show you how to gently and easily insert the rectal tube for yourself. Don't be alarmed about the rectal tube as its the size of a pencil and is inserted approximately 3cm. The equipment that we use allows you to operate the system yourself in privacy while regulated by a therapist. What Preparation is Needed Before a Treatment? No special preparation is required, but healthy eating and a fruit and vegetable diet a few days before the colonic is recommended to improve the results of the treatment. During the consultation, your diet and related health history can be discussed to help you achieve a healthy lifestyle. Colon hydrotherapy is a safe, effective method of detoxifying your body by removing waste from the large intestine, without the use of drugs. By introducing filtered and temperature-regulated water into the colon, the waste is softened and loosened; resulting in evacuation through natural peristalsis (wavelike movement). Modern FDA Colon Hydrotherapy equipment is used during treatments. FDA registered equipment features temperature and pressure controlled water, a built-in chemical sanitising unit with a water purification unit. The unit is cleaned and sterilised after each treatment and each client has his or her own disposable rectal tube, which is only used once to prevent contamination. The number of treatments depends on each individual and what they wish to achieve. Will Laxatives or Enemas Achieve the Same Results? Laxatives and enemas are not substitutes for colonic irrigation. Laxatives act as a chemical irritant and stimulate the muscular walls to abnormally contract to expel the irritating substances. Administrating them orally can also interfere the upper alimentary tract where important digestion takes place. Enemas are helpful to clean out the lowest 25 to 30cm of colon, but you are missing out approximately the last 1.2 meters. Therefore, laxatives & enemas do not clean the whole colon as effectively as Colon Hydrotherapy. What Will a Colonic do to My Colon? The object is to cleanse and balance the colon by removing faecal matter from the walls and diluting bacterial toxins in the large intestine. The therapeutic effect of colonic irrigation improves muscle tone of the colon. You would be amazed how much old hardened, faecal matter that can build up in your colon, causing sluggish bowel movements, results in excess weight. While this is not a weight loss procedure, it is interesting to note that many clients who complete a series of colonic treatments often report significant weight loss. In ​ addition, improved bowel function certainly contributes to health gut function, which results in long-term weight loss. Who will Benefit From Colon Hydrotherapy? Most people will benefit from colonic irrigation in some way and it is known to help with any of the following;	Acne, bloating, bad breath, body odor, candida, constipation, colitis, eczema, diverticulosis, diarrhoea, flatulence, hemorrhoids (mild to moderate), headaches, heartburn & indigestion problems, fatigue, food allergies, irritable bowel syndrome, skin problems, stress, parasites and excess weight. How Can I Tell If My Colon is Not Functioning Properly? There are many signs of a dysfunctional colon, some of the common signs are constipation, bloating, bad breath, body odor, diarrhoea, flatulence, fatigue, headaches, irritable, sluggishness, skin problems. Can a Colonic Wash Out Good Bacteria? Colonic irrigation washes out the harmful bacteria that are not required to allow the good intestinal flora to increase. Good bacteria can only multiply in a clean environment. So each time you have a colonic you are clearing out bad bacteria to allow friendly bacteria to grow, helping the colon to absorb nutrients more effectively. Each person will experience different benefits. Most likely you’ll be feeling great, lighter, a sense of well-being, a lifting of spirits, a balance in mood, improved sleep, improved skin condition, weight control, with better digestion, a decrease in heartburn and indigestion, and have regular bowel movements. You could feel light-headed or maybe chilled after your treatment due to the amount of toxins you’ve released. This will only last for a short time and then you'll be able to continue your day as normal. To get the full benefits from your Coloinc session it is To get the full benefits from your Colonic session it is best to follow the tips we offer for the next 24 - 48 hours  Replace intestinal flora with a	probiotic.  Drink plenty of water, herbal teas or an electrolyte drink.  Avoid heavy meals and choose more easily digestible foods such as soups and cooked Vegetables. How Will Colonic Irrigation Help Me? Who Will Benefit From Colonic Irrigation? Can a Colonic Wash Out All The Good Bacteria?